Gallia Academy sophomore Katie Queen clears the bar in the pole vault event during the 2018 Battle for the Anchor held April 30 at OVB Track and Field in Point Pleasant, W.Va.
ROCKSPRINGS, Ohio — A baker’s dozen added. From the second day of the Division II Southeast District track and field championships on Saturday at Meigs High School, a total of 13 local athletes — eight from Meigs, four from Gallia Academy and one from River Valley — joined the seven Raiders and one Blue Devil from the opening day as qualifiers to the Region 7 championships. On the first day of the meet, the RVHS boys advanced the 4x800m relay team of Kyle Coen, Brandon Call, Nathaniel Abbott and George Rickett, as well as Eric Weber in the discus throw. The Lady Raiders had shot putters Madison Tabor and Kelsey Brown advance from Day 1, while Cory Call moved on in the long jump for the Blue Devils. The Lady Marauders had a pair of relay teams move on, as the 4x100m relay team of Katilyn Brinker, Kassidy Betzing, Lydia Edwards and Taylor Swartz was fourth with a time of 53.44, and the 4x200m relay team of Swartz, Edwards, Madison Cremeans and Madison Fields was fourth with a time of 1:53.16. Individually for the Lady Marauders, Betzing won the long jump with a leap of 17-5¼, and was fourth in the 100m dash with a time of 13.26, while Swartz was second in the long jump at 16-5¾. Two Blue Angels advanced to the regional meet, as Sarah Watts won the 800m run with a time of 2:22.83, and Alex Barnes was fourth in the long jump at 16-00¾. The only Lady Raider to move on from Saturday was Elisabeth Moffett, who was third in the discus throw at 94-00. For the RVHS boys, Abbott added two events to his regional docket, as he was third in the 800m run at 1:59.20, and fourth in the 3200m run at 10:36.78. Advancing for the Gallia Academy boys, John Stout was first in the 200m dash with a district-record time of 22.28, .22 faster than the previous district record. Stout also qualified in the 100m dash, finishing second with a time of 11.19, while Logan Blouir claimed third in the high jump at 6-1. Moving on for the Marauders, Riley Ogdin was third in the shot put at 46-10, while Bailey Caruthers was fourth in the high jump at 6-1. In both the boys and girls team standings, Sheridan, Warren and Fairfield Union finished first, second and third respectively. The Generals won the boys team title with a 167, while WHS had 92 and FUHS had 60. The Blue Devils were sixth with a total of 46, River Valley took 10th with 28, while Meigs was 12th with 18. The Lady Generals posted a winning total of 128, 9½ ahead of Warren and 14 ahead of Fairfield Union. The Lady Marauders were sixth with 42, GAHS was eighth with 32½, while RVHS was ninth with 26½. 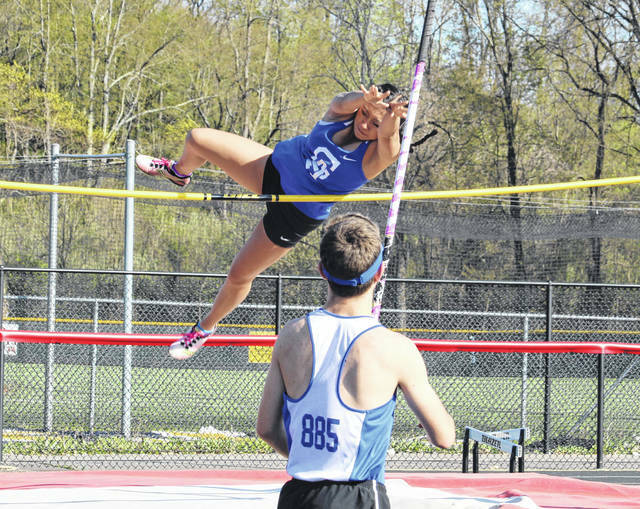 The Region 7 meet opens on Thursday at Muskingum University, where it will finish on Saturday. Visit www.baumspage.com for complete results of the 2018 Division II Southeast District championships at Meigs High School.